Welcome to the Union Parish Assessor's Office. As your Union Parish Assessor, my staff and I are here to serve you and it is our pleasure to do so. Our office is here for you and we welcome all comments and questions. Please take time to look around and discover what our office does for you. Lifelong Union Parish resident Lance Futch was about to graduate from the University of Louisiana at Monroe (then NLU) with a bachelor of Business Administration when former Assessor Yyvern Taylor asked Lance to work for him. Since beginning his career at the Assessor's Office in 1995, Lance has worked as a field deputy canvassing the parish measuring and photographing new construction. He then transitioned into assisting with calculating the personal property values of parish business assets based upon information submitted by the respective business. As chief deputy since 2004, Lance has been directly involved in the valuation process of land, building, aircraft, drilling rigs, oil and gas wells, towers, pipelines, and all general businesses as well as overseeing the daily operation of the Assessor's Office. In 2001, Lance earned the designation of Certified Deputy Assessor by continuing his education through the International Association of Assessing Officers (IAAO). Lance has maintained his certification thru IAAO earning over 638.5 credit hours. He was sworn in as the Union Parish Assessor January 1, 2013. Lance's mission is to fairly and equitably assess all property in Union Parish for ad valorem tax purposes. Our office is here to serve you. 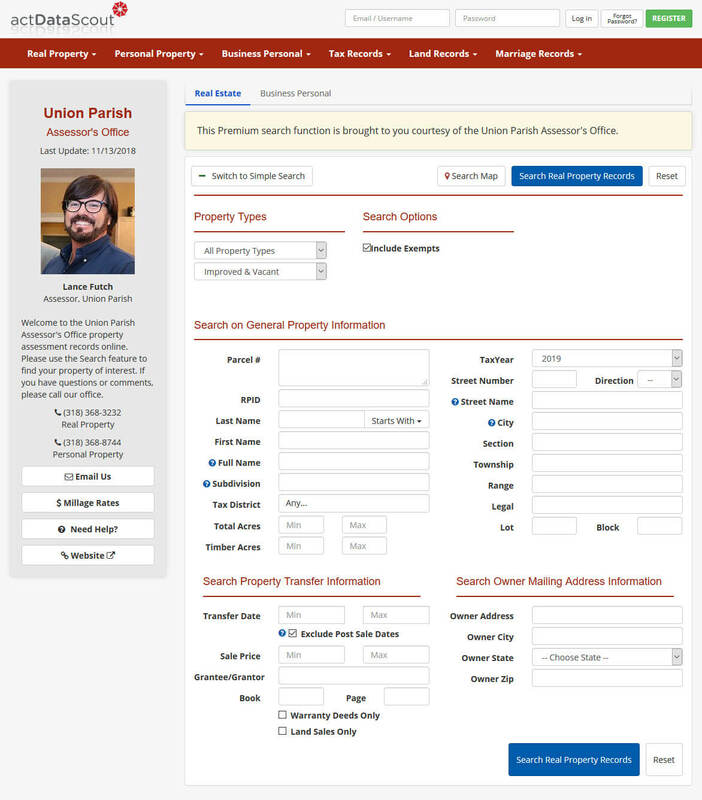 Union Parish's real estate records are available online and free to the public. Search records using a variety of different search criteria such as name or address. Use the power of the interactive mapping functionality by searching, viewing, and selecting different properties of interest directly on the map. Latest parish millage rate information. Free tax calculator Try our free tax calculator to estimate your taxes. Check out these LAT forms. Here you will find a brief list of services offered by our office. Some of these are available online such as the Sales Questionnaire Form and printable LAT forms in PDF format. One of the most important services our office provides is tracking Homestead Exemptions. To learn more about this and to see if you may qualify, click the button below. LAT forms are a tool that you can use to tell us about your property. 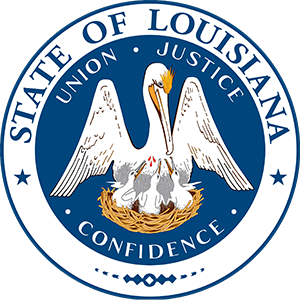 You may download and print LAT forms that are approved by the Louisiana Tax Commission. If you recently purchased property, take a moment to fill out this questionnaire and provide us details of the transaction. This helps to ensure Fair Market Value of assessments. In order to qualify for homestead exemption, one must own and occupy the house as his/her primary residence. Regardless of how many houses are owned, no one is entitled to more than one homestead exemption, which is a maximum of $7,500 of assessed value. If you change primary residence, you must notify the assessor. It is advisable to go in to the assessor’s office and apply for homestead exemption as soon as you purchase and occupy your home. You own and reside at the property in question on the assessment date of January 1st of the taxable year. You sign for the exemption in the manner prescribed by law. The property is not owned by a corporation, partnership, etc. The property is not being purchased under a contract where seller maintains ownership until the end of the contract term. You are already receiving homestead exemption. You file a signed application with the Assessor in the Parish where the property is located. You have an adjusted gross income of $73,851 or less as reported on your federal tax return. If husband and wife file separately, the combined income for both must be $73,851 or less. You are 65 years old or older on or before January 1st of the application year. You are qualified as at least fifty (50) percent disabled by the US Department of Veteran Affairs. (You must provide a copy of your letter of disability from the US Department of Veterans Affairs.) Annual recertification is required. You are permanently, totally disabled as determined by a final, non-appealable judgment of a court as certified by a state or federal administrative agency with the authority to do so. A copy of the judgment must be provided. You are the surviving spouse of a 100% disabled veteran. Please contact our office to determine if you qualify. Each year, the Louisiana Tax Commission requires our office to send LAT forms to selected property owners. These forms allow property owners to give us information about their property. Below you will find links to forms approved by the Tax Commission. If you have misplaced your form or need additional ones, you may download and print them here. If you do not have the Adobe Acrobat Reader, you may download it here. LAT 1 Residential - To be used by the owner reporting any property that consists of land with improvements, whether urban or rural, and used for residential purposes. LAT 2 Vacant Land - To be furnished to the owner of any parcel of vacant land. LAT 3 Apartments - To be used in addition to the Land Report form for any owner of any apartment or residential complex that is not applicable to LAT 1. LAT 4 Commercial & Industrial - To be furnished to and used by the owner of any improvement of a commercial or industrial type property. LAT 5 Business Personal Property - Used to report general business assets such as inventories, merchandise, furniture and fixtures, machinery and equipment, leasehold improvements and miscellaneous property, consigned goods, leased, loaned or rented equipment, furniture etc. LAT 5A Tax Exempt - Used to report tax-exempt buildings, machinery and equipment, furniture and fixtures, consigned goods, leased, loaned or rented equipment, furniture etc. LAT 6 Loan & Finance - Used to report repossessed property and taxable credits of loan and finance companies. LAT 7 Cellular Industry - Used by Cellular Industry companies doing business in the Parish or Taxing District. LAT 8 Cable TV Industry - Used by Cable Television Industry companies doing business in the Parish or Taxing District. LAT 11 Watercraft - Used to report watercraft, motor vessels and barges, other than those employed in interstate commerce. Gasoline powered watercraft and vessels employed in fisheries activities for human consumption are exempt from property taxation. LAT 11A Watercraft - Used to report Outer Continental Shelf Water Vessel Operations. LAT 12 Oil & Gas - Used to report oil and gas properties. LAT 13 Drilling Rigs - Used to report drilling rigs and related equipment. LAT 14 Pipelines - Used to report pipeline properties. LAT 15 Aircraft - Used to report aircraft, except those owned by a company engaged in the business of transporting passengers and/or property for hire on regular scheduled flights, which are assessed as public service property, are subject to valuation and assessment by Parish Assessors.